Railway Union Bridge Club, Sandymount,Dublin 4, Ireland. Looking forward to Easter Egg competition Monday night - and I see Mervyn is guarding the eggs very well!! Every Thursday at 10am in Monkstown Rugby club/Pembroke Cricket Club, come along and enjoy some friendly bridge and a cuppa! Visitors welcome. We are a very friendly and social club playing every Monday night at 7.30pm in the hall of Railway Union Sports Club at Park Ave, Sandymount, Dublin 4 and every Thursday morning at 10am in the hall of Monkstown Rugby/Pembroke Cricket club, Park Ave, Dublin 4. 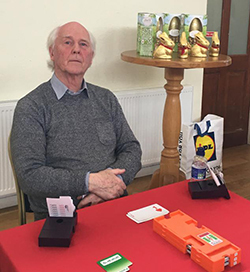 We are affiliated to the Contract Bridge Association Ireland (CBAI) and belong to the Dublin South Region, with many of our members playing in leagues and competitions organised by the region. Membership is currently closed but application forms are available from the club secretary at railwayunionbridge@gmail.com and your name will be placed on a waiting list. Alternatively you may download the form by going to Membership on the menu. Just some of our winners from Easter Egg Night at Railway! We had a whopping 34 pairs taking part this year - and it was a 'scramble' to the top! Well done to Deirdre Morris and Jennifer Nolan who came first, Tony Hayes and Roisin Quigley in 2nd, Fiona and Walter McNicholas in 3rd - and we were delighted to see, straight out of beginners class, Des Hogan and Tony Dunlea in 4th place. Well done guys - and everyone who took part. Well done to Yvonne Flanagan and Rita McAlinden who are this year's winners of the National Novice Competition - the JJ Murphy Cup. It was great to see such a great turnout from Railway Union at the competition in Athlone - and great to see the girls win overall with an impressive 62.02% score. I am sure with our recent successes, and lots of our members who seem to have been bitten by the 'Bridge Bug' - we'll see many more of our players out again for next season! Pictured here are Yvonne and Rita being presented with the Cup from CBAI President, Peter O'Meara. This year we had two Novice pairs who came out top in the CBAI Sims Pairs competition! Well done to Yvonne Flanagan and Rita McAlinden who placed first nationwide, and to Sheila McDonald and Daphne Gaynor who placed 2nd nationwide. The girls not only earned a few hundred masterpoints each for their achievement, but also some money! Pictured here are the players Rita, Yvonne and Sheila (Daphne absent from photo) receiving the prize money. Congratulations to Kieran Crowley and Deirdre Morris who are this year's winners of the John Burke Cup. The John Burke Cup is one of our major annual competitions and is a draw for partners. Railway Union Bridge Club was delighted to host the Dublin South Region's Kay Downes Trophy 2019 for the second year. There was a great turnout of 20 pairs and we welcomed members from many clubs in the region. A big thank you to the Dublin South Region President, Brid Kemple, who was there to present the trophy. We were particularly honoured this year to have Kay Downes herself present the trophy with Brid - and also welcomed Kay's daughter Brideen and granddaughter Niamh. Brid paid tribute to all Kay's hard work for our region and indeed for CBAI and EBL, and all the novices were delighted to meet Kay! Congratulations go to Bernie O'Sullivan and Bernie Price who are pictured here receiving the beautiful trophy from Kay Downes and Brid Kemple, both ladies were thrilled with their win in what was their first competition. Thank you again to the Railway Union Committee and members who all helped out on the night, and a big thank you to Fiona O'Gorman who acted as Tournament Director. Teas, coffees, wines and nibbles were enjoyed in the bar while hands were discussed in great detail by everybody! Well done to everyone who played in the second 4Fun team qualifier in Milltown Golf Club on Monday 28th Jan, as usual Railway Members were out in force and I'm delighted to report the success of two of our teams who have now qualified for the National 4Fun final in Westmanstown in May. Congratulations go to Kieran Crowley, Sarah Hardiman, Anne Kelly, Colette Stokes, Caroline Crowley, Sheila McDonald, Mary Lynn and Phil Harnett. We wish them luck in May! Huge Congratulations to Anne Kelly, Mary Lynn, Mary Kane and Celia Magahy who were the winning team for this years Ruth Giddings Cup, and qualifiying for the National Teams Final in Athlone in April. A fantastic result for the girls - and great for the Railway Union profile too! Not only did we take first place - Railway member Bob Neilson was on the 2nd placed team, while our other Railway team of Julie Rowan, Mary Burke, Ruth Maher and Aine Connolly, placed 3rd. Well done everyone! The girls were presented with the Cup at the presentation afterwards - and on inspection of the cup we were reminded of our previous holders, Fiona, Caroline, Maeve and Mary Seaver, who also won this cup in 2015. Let's keep the competition spirit going and hopefully we will see more Railway members names on it in the future! Mary Lynn, Anne Kelly, Celia Magahy and Mary Kane pictured at the awards presentation with DSR president, Brid Kemple. Our Club Teams night concluded last night and what a turnout this year - 21 teams which is the biggest entry we ever had! Huge congratulations to Graeme Williams, Walter McNicholas, Mary Meagher O'Keefe and Patricia McGeown who are this year's Club Teams winners. The final made for a nail-biting finish as John Royds gave us updates after each session - but the winning team had a fantastic finish, ahead of Colettes Stokes' team in 2nd place, and Roisin Quigley's team who came third - with just one point in the difference. We had prizes for 1st and 2nd Place B teams, and of course a Novice team. Graeme said a few words at the end and I think he summed up exactly what our club is all about - good spirit, friendliness - all with a competitive edge of course - which keeps life interesting at the bridge table! Thanks to everybody who contributed to the success of the night, from the entry co-ordination, gradings, seating position, prize money envelopes, to the room and table set up and tidy up - and of course to John Royds who, as Graeme mentioned in his speech, is just the best TD! I would particularly like to thank our three subs - Sharon McKenna, John Murray and Avril Barry, who all filled in for last minute cancellations (and in John's case, the very last minute!). At this time of year with cold and flu bugs going around it was so important to have that cover. We had a great turnout for Railway at the Mens and Ladies' National Pairs and Teams Competition last weekend in Clane. There was very strong competition over the days but we all really enjoyed the days - and the challenge! Congratulations to our Railway Players who made the podium. Phil Harnett was on the winning Regional Master Team - which is fantastic for Phil as an A1 to be so highly positioned. - well done Phil! Also to Colette Stokes and Sue Power who were on the winnng Intermediate A Team. There are lots of qualiifers, national competitions and congreses coming up and I hope we will be well represented again. Christmas Party and Sandymount Gospel Choir! We had a fantastic night at our Christmas Party - plenty of bridge, mulled wine and mince pies - and of course our special guests, the Sandymount Gospel Choir, who kindly came along and sang a few festive tunes! And it was great to see that we have a few mutual members, Cassandra, Rita, and Finola, who joined in the song. A huge thanks to all the choir for giving up their time at such a busy time of year. Well done to Carol Horan and Sarah Hardiman who won Best Novice at the Tralee Congress this weekend. The novice competititon was incorporated into the Gala pairs competition - and not only did they win Best Novice, they also positioned 9th place overall - which, out of a field of 30 pairs that included Intermediates and Masters, is a pretty impressive result! Well done to our Turkey Competition Winners! And festive prizes were also given to 4th place down to 15th! We had a great night and the individual competition was great fun, and a great opportunity to play a hand of bridge with sombody new. Thanks to John Royds who co-ordindated everthing so well and had us all sitting at the right place and the right time! Also thanks to Caroline and Carol for the beautiful festive display of all the prizes. See you all at the Christmas Party next Monday for more festive cheer! Congratulations to Mary Kane and Celia Magahy who placed 2nd in Duffy Cup - the DSR Inter B Pairs Qualifier for the National Pairs Finals which will take place next March in Athlone. Well done girls! And a huge thank you to all who took part - there was a great turn out for Railway for the Duffy Cup - and of course we will continue to encourage more to get out there and compete! We were also represented in both the Master and Inter A pairs divisions - and although we weren't picking any silverware on the day - we hope we may get a qualifcation closer to the time. President's Charity Night - Thank You! Our charity night was a mega success - what a turnout - and a turnover! We had more than a full house with 24 tables, ran two sections AND welcomed visitors from other clubs - who were very impressed with everything about our club! We had the most generous donations in from our members and visitors on the night, and even had donations from people who know nothing about bridge! I think just the mention of who our chosen charity was brought out the generosity in people, and everybody was keen to throw us a few bob. We look forward to presenting our cheque to the Capuchin Centre later next week, just in time for Christmas. Thank you to all who came and supported us. Thank you to the hardest working committee - from the coordination of food, prizes, seating, boards, envelopes, biros - to the room set up and decoration, with huge thanks to Julie and Martin who spent the afternoon hanging bunting and squeezing in those 25 tables - all this preparation work made way for the success it was! Thank you to our TD John Royds for running a smooth competition on such a busy night. And thank you to all our visitors - it was great to showcase our club on such an occasion. A fantastic night was had in the club for the final night of the Martin Cowley Cup - our annual Club Pairs competition. The two-week event was well attended with 16 tables and was brilliantly co-ordinated by Roisin, and of course by John Royds at the helm as Tournament Director - a huge thank you to both for all the hard work and organisation! Thank you to Martin Cowley who came down to the club to present the trophy. Martin gave a fantastic speech, funny as always, and regaled us with stories from the early days and the startup of the bridge club - where it seemed Martin was founder, member, tournament director, secretary, treasurer, president... and lots more besides! Bernie gave a lovely speech and told us how much they enjoyed playing in our friendly club - and it was funny to see how surprised they were when their names were announced! But two great players they are and well deserved - we were all delighted to see them win. A lovely atmosphere prevailed in the bar during the awards while we all had a glass of wine and chatted. It certainly was a great start to our bridge season - and now with our first major competition under our belt we look forward to the coming year, our weekly Monday nights, Fanagan League matches and congresses and competitions galore! Railway Union had a great turnout for the 4FUNTeams qualifier in the RDS on Friday 26th and it was great to see our players ranking, and fingers crossed, qualifying for the final next May. Well done to the Railway players who made the podium - Yvonne Flanagan, Maeve Cassidy, Fiona O'Gorman, Colette Stokes, Declan Moran, John Murray, and Cassandra Byrne and Carol Horan (pictured with teammates Mike Gowie and Teresa Gavin), all pictured here with Dublin South Region President, Brid Kemple. Thank you to all who played - attending compettions like this really heightens the profile of our club. And in true Railway style we definitely brought the fun element to the night and embraced the spirit of the competition!